So you’ve made sure to select the right lifejacket for your type of boating. But a lifejacket is only good for saving your – or your child’s – life if it stays on snugly. A poorly fitting lifejacket can be just as bad as not wearing one, especially if you’ve taken a knock to the head as you’ve gone overboard. Check out our handy tips to make sure everyone stays safe out on the water. Resist the temptation buy a larger lifejacket than your child needs, for them to ‘grow into’ – buy one that fits snugly. The buckles should do up easily, but there shouldn’t be so much space that they can slip out of it. A good guide is to make sure there’s no more than two finger-widths of gap on the shoulders – if you can fit three or more fingers between your child’s shoulders and the lifejacket, get one that’s a better fit. Try gently lifting your child by the lifejacket – if they slip out, it’s too big! There are different lifejackets available for different water sports. Find out what’s best for your sport here. Any lifejacket you wear should be a good, snug fit. Like a good coat, it should fit well and not be too large or small. Make sure you can do the buckles up easily. Check how much buoyancy you’ll get from your lifejacket – this is measured in Newtons. Inshore lifejackets must have at least 71N of buoyancy, while open water lifejackets should have at least 150N to help keep you afloat in rougher waters. A good collar on a lifejacket ensures that your head stays above water, in the event you’re knocked out when you hit the water. And for both kids and adult lifejackets, a crotch strap is an essential piece of kit to make sure you stay in your lifejacket, if you go overboard. In 2016 eight people died after the fishing charter vessel Francie capsized crossing the Kaipara bar. A report from the Transport Accident Investigation Commission found that all on board would have had a much higher chance of survival if all had been wearing lifejackets with crotch straps to avoid the jackets riding up. The report recommended that lifejackets with crutch straps and 401 inflatable lifejackets be used for all bar crossings. For more information see our article on the right lifejacket for your activity. So why a crotch strap? If you do end up in the water, the buoyancy of a lifejacket can be quite strong. 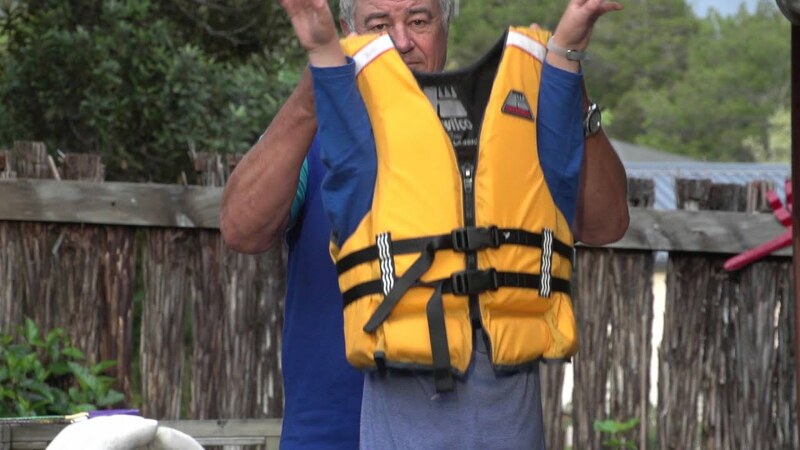 Any movement inside the lifejacket, including trying to swim or struggling to stay afloat, can mean it ‘rides up’ – in extreme cases, and especially if the lifejacket is a bit big for the user, the lifejacket can slip right over their head. No good if you’re already in trouble, in the water! A crotch strap attaches to the front and back of the lifejacket with a strap between your legs, and helps prevent the lifejacket from riding up over your head. It may not always be comfortable, but it could save your life. How can I get it fitted? Crotch straps are generally one-size-fits-all lengths of webbing, with a buckle to allow the lifejacket to be removed. They’re adjustable so are suitable for most common types of lifejackets. While some lifejackets have crotch straps built in, there’s a loop at each end of the webbing that fits onto the existing straps on most common lifejackets. Simply adjust the buckle so it’s a comfortable, but snug fit between your legs. Your local marine retailer should have a ready supply of crotch straps to suit your particular lifejacket, and most should be able to fit them for you.